Paul first visited Thailand in 1996 and has been retired in Siam since 2007. 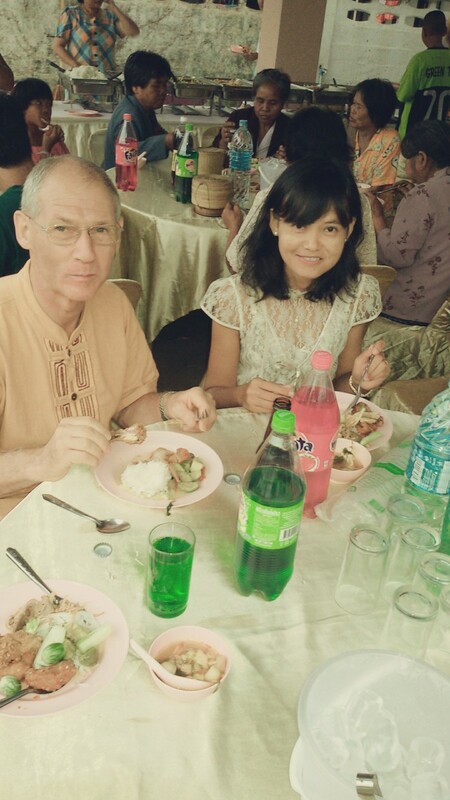 He has a beautiful and loving Thai wife and can speak Thai. 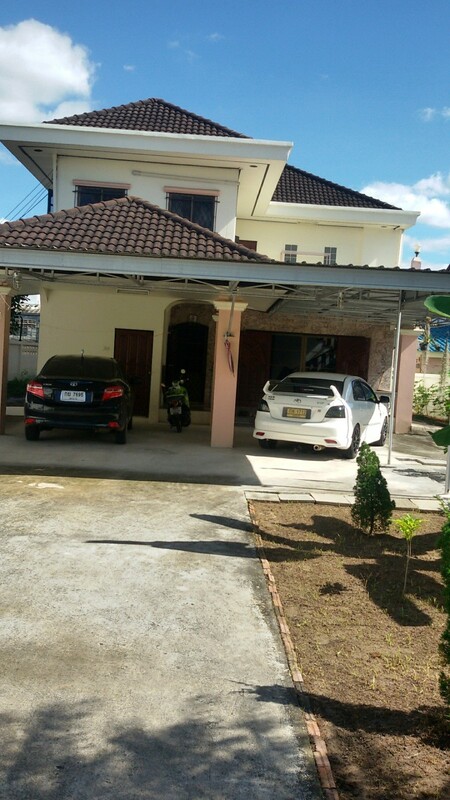 In August 2014, my wife Suai and I purchased a large home in Udonthani, Thailand. Prior to moving in, we had the house cleaned and immediately selected an auspicious date to have our home blessed by Buddhist monks. After inviting neighbors, friends, and family to our new home, the big anticipated day arrived a few days after my birthday on a rainy morning in the middle of August. 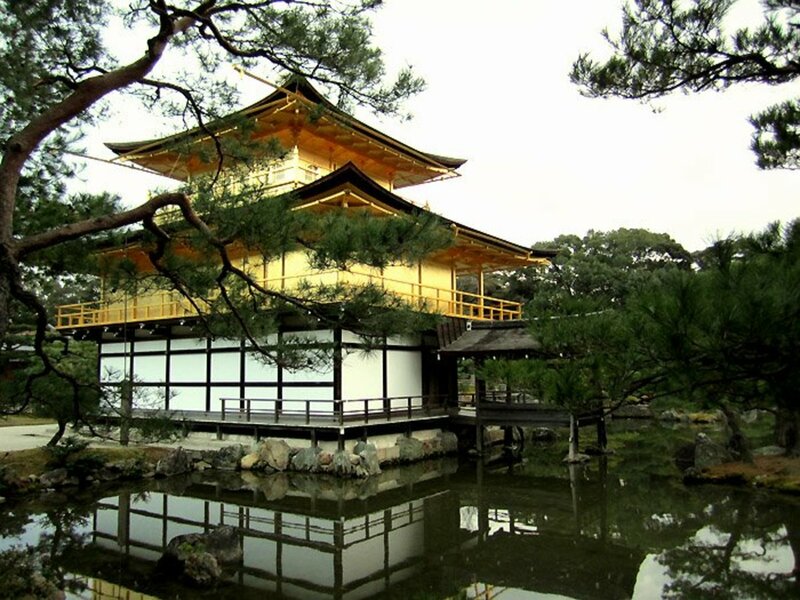 This article primarily relates what I remember happening on the day of the house blessing from the first appearance of guests at around 7:00 am to the conclusion of our offerings to monks and partaking of a brunch at about 11:00. It includes the monks' home blessing ceremony in our living room, offerings to monks, and other rituals to ensure the safety, good luck, and prosperity of our home. While growing up in a Catholic family, I never attended a home blessing, even after moving to our purchased farm. Although a few neighbors had house and barn warmings, mom and dad were too busy to bother with things like this. After purchasing a condo in Taiwan and three homes in the United States, I still had never held a house blessing or warming. This all changed after my Thai wife and I purchased a big home in Udonthani, Thailand. Actually, home blessings are very common ceremonies in almost all religions of the world. I just never experienced one until living in Thailand. While teaching at a Catholic school in Bangkok, a new classroom building with a library was completed during my first year there. I remember the school being blessed by a priest who walked up and down the corridors sprinkling holy water while saying prayers. The prayers called on God to bestow blessings of good fortune, success, and happiness on the school and its students and teachers. These same blessings are bestowed by Buddhist monks in Thailand home blessings. 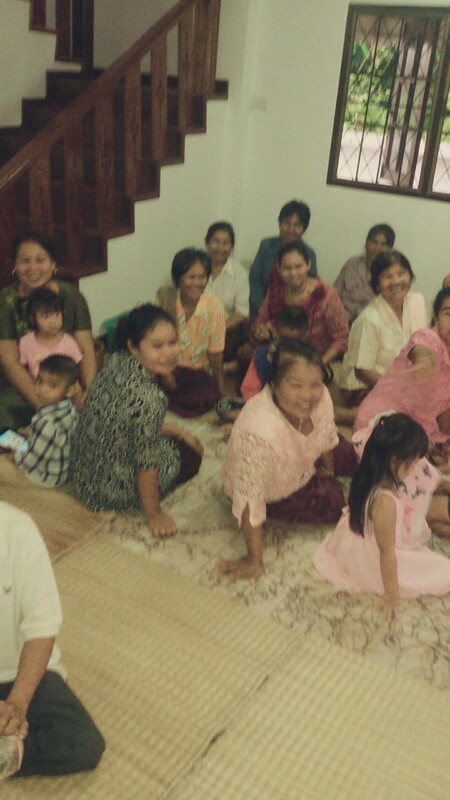 The aim of the home blessing which is called keun ban mai in Thai is to bless the home and its occupants. It is hoped that the family occupying the home will live healthy, in prosperity, and in good luck free of evil spirits. 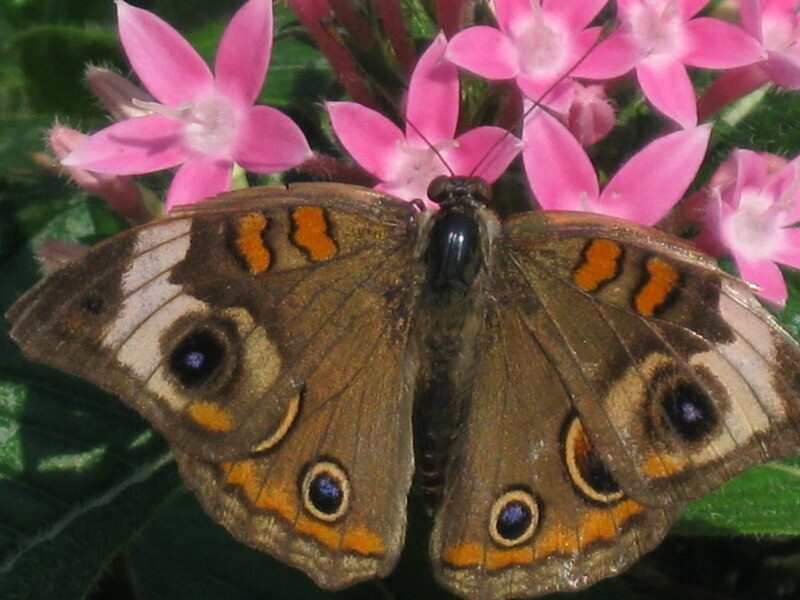 Shortly after purchasing a home in early August, our preparations for a home blessing began. They consisted of selecting an auspicious date, engaging the services of Buddhist monks, and preparing our home for the blessing. Since my wife and I had never held a home blessing before, we sought the advice and assistance of my mother-in-law and our new neighbors for selecting a lucky date, getting monks to conduct our home blessing, and preparing for the home blessing. Traditionally, the Thai consider Friday and Sunday as lucky days and Saturday unlucky for home blessings. I believe that we decided on having our home blessed on Friday, August 15. My mother-in-law has always had a good relationship with the monks at her village temple. The problem, however, was that the temple was 20 miles away and less than five monks were there. With the advice of my mother-in-law and elderly neighbors, we decided on getting nine monks from a temple nearby our home. Home blessings should be done by an odd number of monks and nine is the best number. Undoubtedly, this is because nine is considered a lucky number in Thailand. On the day prior to the home blessing, our neighbors came over in the morning. They gave us advice on the correct placement of mats, cushions, bowls, candles, and Buddha images which we had prepared for the monks. We decided that it would be best for the monks to sit in our spacious living room. Three would be against side windows. Another three would be against a side wall next to the front door. They would be perpendicular to the monks against the windows and the head monk would be among the three. Finally, three more monks would be sitting against a wall perpendicular to the windows. Before the neighbors departed, we all walked outside around our home in single file three times. My wife then hired a food service to prepare a buffet brunch on the day of the home blessing. The brunch would be served under our carport and adjoining front driveway area. The food service would provide round tables and chairs for our guests. At around 7:00 a.m. on Friday, guests started arriving for our home blessing. Many were friends and relatives from my wife's home village 20 miles away. About an hour later, neighbors and local friends made their way to our home. Two of the friends were an expat British citizen and his Thai wife. All of the guests sat on the floor in our living room. At 9:00, nine monks from a nearby temple arrived in a pickup truck. They were quickly ushered into our home and took their seats on the mats and cushions which had previously been arranged. Everyone was a little wet because it had been raining hard all morning. 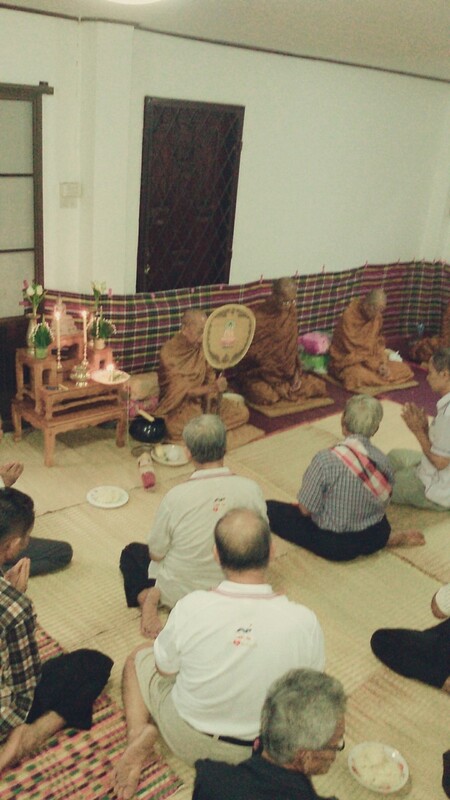 After the monks were all seated, our home blessing began. It consisted of chants during a soi sin ritual, the sprinkling of lustral water, making alms to the monks, sprinkling lustral water throughout our home, binding of the home with a white string, and making a special white symbol at the front entrance. 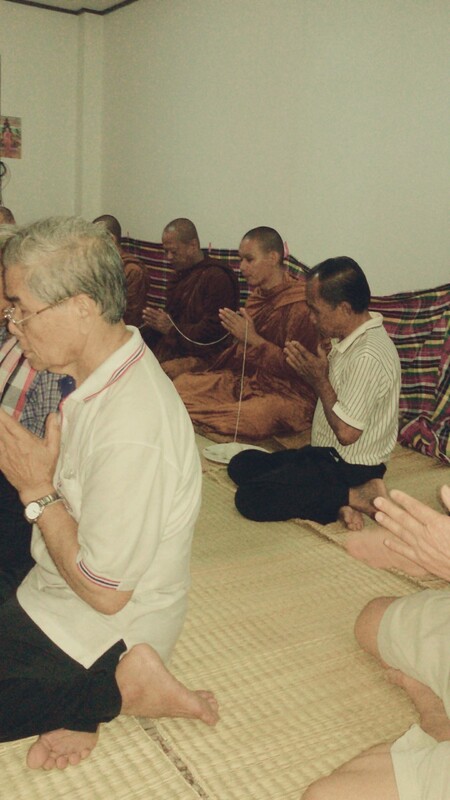 During the soi sin ritual, all monks hold a white string while chanting prayers in the Pali language. The string starts from a Buddha image. 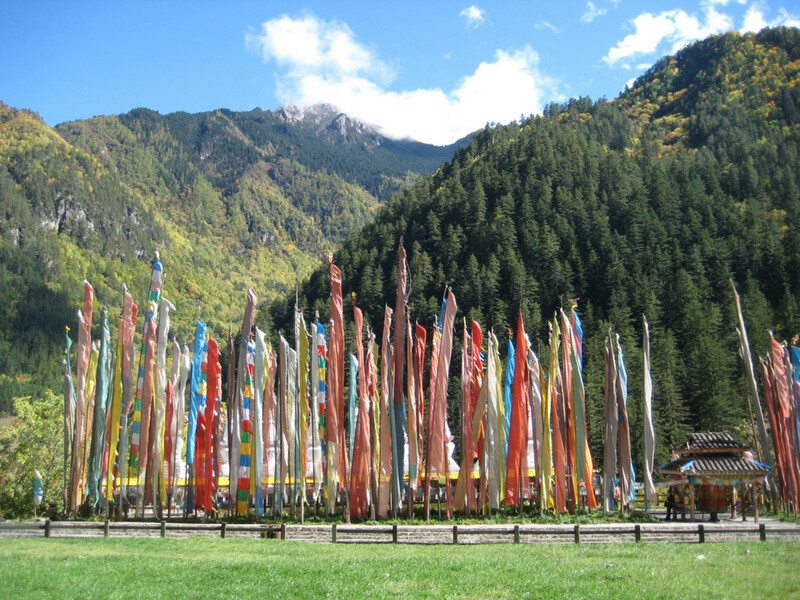 It is believed that as the prayers vibrate through the string, they create an energy to protect the home and give good luck to its residents. The lustral or holy water comes from bowls with wax candles on their rims. As the wax falls in the water, it is believed that this holy water will wash away disease, sorrow, and evil. The head monk sprinkles lustral water on the occupants of the home and their guests. When the monks arrived, each of them carried a big bowl. 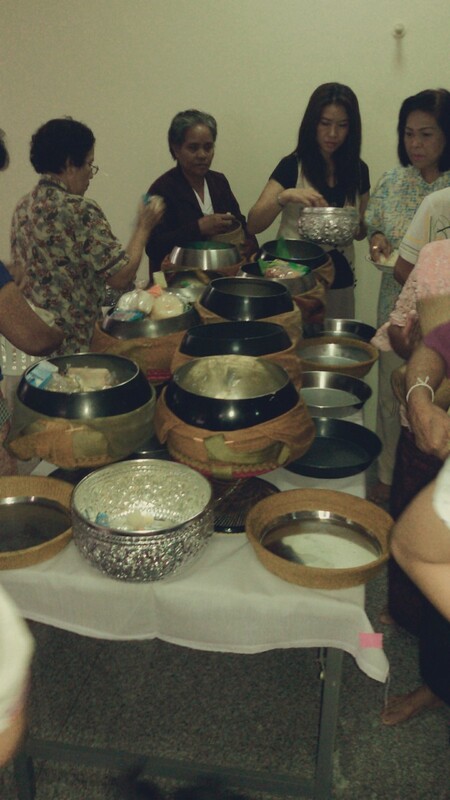 Everyone made alms by putting a small ball of sticky rice, some fruit, and a flower in each of the monks' bowls. In addition, trays containing dishes of food prepared by a food service were presented to each one of the monks. Alms also consisted of donations which my wife and I made to the monks' temple. After the monks sampled each of the presented dishes, it was time to sprinkle lustral water in all rooms of the home. This took place in our living room, dining room, den, kitchen, and three bedrooms upstairs. Before departing, the monks supervised the binding of our home with a white string. The purpose of this was to keep bad spirits away from the home. Finally, above the front entrance of our home, the head monk wrote a Pali symbol using a special white paste. 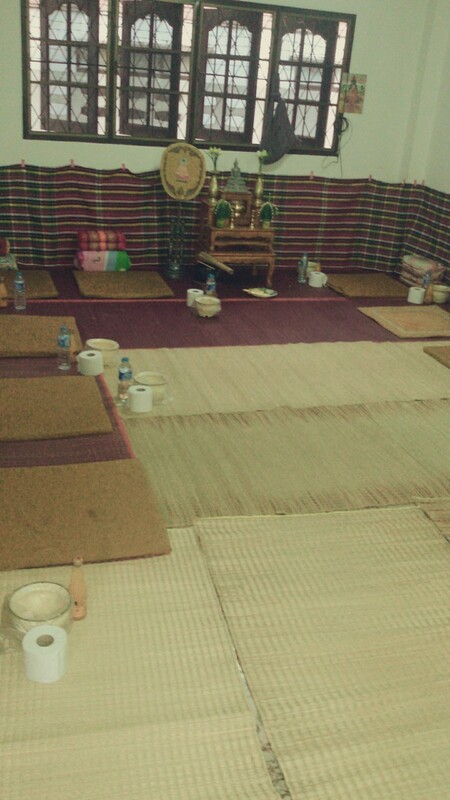 After the monks left our home at around 10:30, we all shared the food which the monks had not eaten. Food and drink were served on round tables set up in front of our home. Although it was still raining, everyone had a good time. 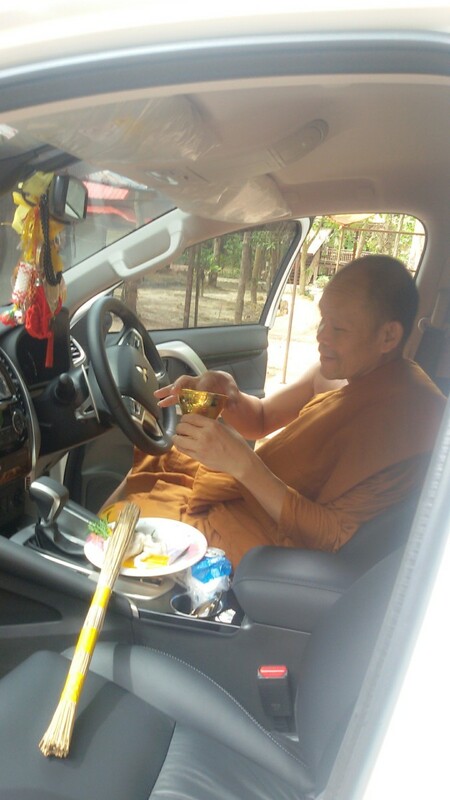 What Is a Buddhist Car Blessing Like? Thank you very much for reading and your comments, Peggy! 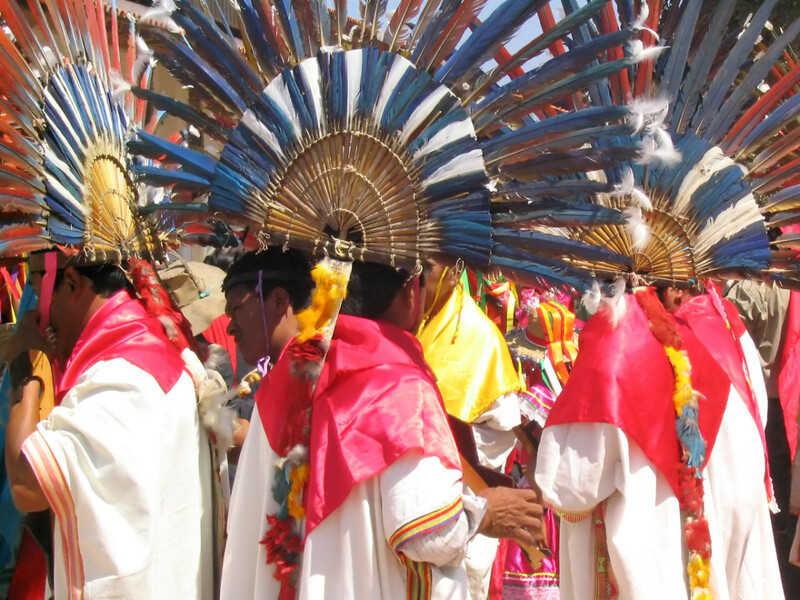 Do you happen to know what the Christian house blessing ceremony is like? Thanks for sharing your home blessing ceremony with us Paul. I have never experienced such a thing and it was interesting to read about and view. May you have many happy years in your new home!